Sundal can be done with any bean seed of your choice though chickpeas is very commonly used.A snack which is low in fat, high in proteins ,very healthy and also filling. After kids come back from school, you can give them any sundal as a snack.You can have it as a tea time snack also. Soak chickpeas in water overnight. Rinse well, add fresh water and pressure cook with required salt till soft.The channa/chickpeas should be soft but not mushy. Drain the excess water and keep aside. Heat oil in a pan/kadai, add mustard seeds when it splutters, add urad dal, red chillies, hing and curry leaves. Fry till urad dal turns golden brown. Add raw mango and saute for a few minutes. Then add cooked channa, salt and grated coconut and give it a nice stir. 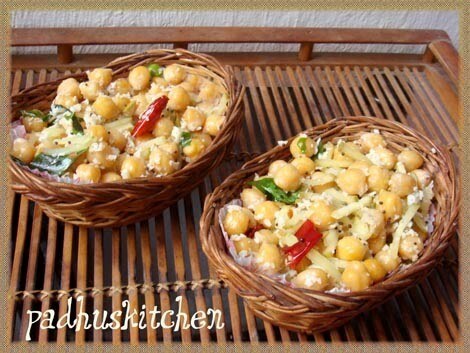 Channa sundal is ready to be served. Meet you all again with an interesting recipe, till then it is bye from padhu of padhuskitchen. My all time favourite sundal, nutritious snacks..yumm..
My fav.I make this often.Looks really yummy! Yum! So simple, healthy and good! i love ur clicks very much this time,so gorgeous. nice preparation padhu...we use black channa daal for choondal...lovely recipe.. Awesome Clicks!!!! Love that Moongil/Ratan Bowl!!! Sundal looks delicious. I love this one a lot most of them it is our snack for tea. my all time fav..sundal looks tempting padhu. Looks very tempting - perfect easy snack and protein packed. Nice! My favorite sundal. Looks great. So I am glad I came across this healthy as well as delicious version of the chana! Loved it! Very beautifully presented. Sundal looks tempting and good for health. One of my favorites .Loos delicious. It sounds like an excellent snack. Thanks for participating. Hi Padhu, I have been following your blog for some time now. Wanted to share a small tip - if you find it useful. Excess water from pressure cooking chickpeas, chowli, mung can actually make good rasam and soup. It is also healthy. For eg., the excess water while preparing chickpea sundal can be kept aside, add a bit of tamarind, rasam powder and boil - similar to tomato rasam. Add a bit of sugar and salt to taste. end with a seasoning of mustard seeds, curry leaves and hing in ghee.